Like many other Tibetans, we were grateful that Kasur Lodi Gyari decided to share his rich knowledge of the Tibetan struggle in his recent article. Gyari Rinpoche has decades of service and sacrifice, and few individuals can compare with his experience or involvement with some key defining events in recent Tibetan history. We hope that our editorial will further the conversation that Gyari Rinpoche’s article initiated and encourage Tibetans and Tibet supporters to join the debate in a civil and constructive manner. With this motivation in mind, we also did not want to repeat points made elsewhere. Migmar Dolma and Tenzin Kelden have already written a response to Gyari Rinpoche’s piece. We highly recommend reading both the original article and their thoughtful response. Based on all this, we would like to offer a few thoughts Gyari Rinpoche’s recent article. There is a critical factor that Gyari Rinpoche’s article appears to overlook, which would eliminate the need for asserting such "suspicions and doubts". U.N. General Assembly Resolution 1723 (XVI) does not refer to self-determination for Tibet (which might or might not be argued to mean the jurisdiction of the Lhasa government in 1951). The resolution refers to self-determination for "the Tibetan people", which means the entire Tibetan people. Under international law, the Tibetan people have the right to self-determination. 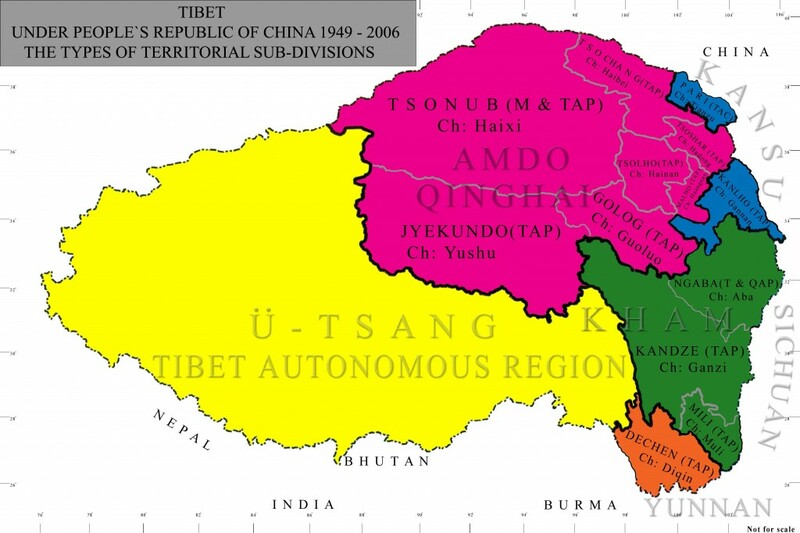 At face value, this means all Tibetans, but where should the territorial boundary be drawn? Here, Gyari Rinpoche’s article touches upon a legitimate issue – though not one requiring any “suspicion and doubts”. One has to look at the specific circumstances to see how self-determination is applied in drawing a boundary. Will it include every single Tibetan regardless of where they live? Obviously not the Tibetan neighborhood in Chengdu or Haidian (in Beijing). But it should for the Tibetan Plateau. Unlike for example in Scotland, Tibet’s recent history involves fluctuating borders and the ebb and flow of political control. Fortunately, though, even the Chinese government considers basically the entire Cholka-Sum that is outside the T.A.R. to be Tibetan autonomous prefectures and counties, strengthening the Tibetan case for self-determination using the boundaries of Cholka-Sum. Certainly there is no reason to categorically state, as Gyari Rinpoche’s article does, that self-determination would not include all Tibetans in Cholka-Sum. As Tibetans, we need to put forth the strongest case under international law for implementing self-determination in relation to the boundaries of Cholka-Sum (which even China implicitly recognizes). It does not make sense to conclude at the outset that this is impossible, when the case is actually fairly strong. counties and prefectures. Click to enlarge. Notably, when this Congressional resolution was passed, Gyari Rinpoche was the head of the International Campaign for Tibet (ICT). ICT was instrumental in lobbying for this resolution’s adoption, and for a long time rightfully celebrated it as one of its more important legislative victories. If this accomplishment were backed away from now, it would be a very sad self-inflicted wound on the Tibet movement. Personally, we have never met an independence supporter who is only seeking independence for western Tibet. Gyari Rinpoche may have something concrete in mind when he warns of this possibility by “some people”, and if so we sincerely hope he shares these facts. Otherwise the risk is that others may seek to distort Gyari Rinpoche’s words to engage in baseless scare tactics. Gyari Rinpoche eloquently writes that losing the moral basis of the overall Tibetan cause is “more grave than the argument between the Middle Way Approach and independence”. He also notes that “irresponsibly criticizing others [is] the misuse of democratic rights.” This argument is not unique to Tibetan society, and in fact is part of the debate in international human rights. In the U.S., the typical example is that yelling “fire!” in a crowded theater is not a valid exercise of free speech. Generally the right of free speech should be balanced against the rights and safety of others. Yet, universal human rights do not recognize the right of others to escape unwanted criticism, or words they do not like. It can be legitimate to sometimes restrict free speech to achieve a compelling societal interest through the least-restrictive means possible, but this is otherwise a very dangerous slippery slope. Simply referring to concepts like “responsibility” without more, and without defining who decides what is “responsible”, seems like an injustice to the universal human rights we all hope for in Tibet. But we might be missing Gyari Rinpoche’s point. Likewise, universal human rights do not recognize a test of worthiness for a speaker. So we were troubled when Gyari Rinpoche’s article referred to “some people who can hardly utter a single word against [China] but has the capacity to criticize His Holiness the Dalai Lama and the Central Tibetan Administration in volumes.” If a point is valid about the CTA, then it is valid regardless of whether the speaker also criticizes China. And if the most vociferous critic of China makes an unfair criticism about the CTA, that does not thereby make it valid. With these points in mind, we believe that Tibetan society would take a step towards greater unity. It would allow the open, respectful discussion between Middle Way and independence that Gyari Rinpoche’s article describes so poignantly. Moreover, democratic rights were clearly a part of His Holiness’ original Middle Way Policy. In 1987, His Holiness proposed a Five Point Peace Plan which included respect for democratic freedoms in Tibet. In His (now-withdrawn) 1988 Strasbourg Proposal, His Holiness stated that the “Government [of Tibet] should be comprised of a popularly elected Chief Executive, a bi-cameral legislative branch, and an independent judicial system.” And in His 1989 March 10 Speech, His Holiness made clear that “[t]he struggle of the Tibetan people is a struggle for our inalienable right to determine our own destiny in freedom [and] is a struggle for democracy, human rights and peace.” Although the Middle Way Policy was changed by the CTA in 2008 and 2010, it was only in 2013 that Sikyong Sangay explicitly stated that the CTA was not seeking democracy for Tibet, a statement that surprised many Tibetans and Tibet supporters. Gyari Rinpoche is one of the “Founding Fathers” of TYC so his views of why the organization was founded are of course important. And he eloquently writes about TYC’s goal of promoting unity. Yet when he argues that TYC was not founded “solely” to promote independence, this seems an unnecessary point. TYC’s founding resolution has four points, including not just “independence” but also “national unity” etc. Logically one could equally say that TYC was not founded “solely” to promote national unity. We say this not to argue but rather to agree that both goals exist in TYC’s founding resolution. In any case, this is a debate that should be up to TYC. We think it is worth noting that of the three other TYC co-founders, one has come out in favor of self-determination, and another joined the pro-independence Tibetan National Congress before he passed away. Gyari Rinpoche himself resigned his role in dialogue with China as His Holiness the Dalai Lama’s Special Envoy in 2012 out of “utter frustration” with the lack of any progress. Given the interest generated by Gyari Rinpoche’s article, the Tibetan people could have benefited from an enlightening public debate among these three Founding Fathers about these topics. Clearly, Gyari Rinpoche is part of a generation that has a great deal of experience and perspective to share. As the Tibetan people – and especially the younger generation – grapple with the important choices ahead, the Tibetan cause benefits by having a strong historical perspective. We look forward to these constructive discussions continuing. * NOTE: Gyari Rinpoche mentions that some seek MWA, some seek independence, and some seek self-determination. However, self-determination is an international right the Tibetan people have. MWA, independence or some other form of self-rule are goals that Tibetans may seek based on that right. Self-determination is not a goal or choice itself. There really is not a debate whether Tibetans have the right of self-determination. The debate within the Tibetan community is whether Tibetans should exercise that right to seek some form of autonomy or independence. ** NOTE: This resolution is a non-binding "sense of Congress" resolution that lays out the Congressional position but does not set policy for the Executive Branch.